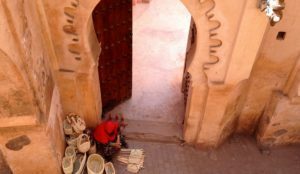 Visit Marrakesh: What are the best things to do and see in the Red City? A lively and captivating destination, Marrakesh offers a perfect blend of culture, picturesque landscapes, and fascinating architecture. Often nicknamed “The Southern Pearl of Morocco” or “The Red City”, Marrakesh is home to a wide array of places of interest despite the inevitable damages induced by mass tourism. You will not think twice before booking your plane tickets to visit Marrakesh! To help you plan your stay more easily, we have prepared a list of the best things to do in Marrakesh. So, what to do and visit in Marrakesh? To make sure you don’t miss anything in the city, follow the guide ! You cannot visit Marrakesh without indulging in the luxury of a hammam (steam room). Be prepared for a different experience from a typical western spa: here, modesty is not an option, you will be required to undress (save for your underwear). Hot water will be splashed on your body before your skin is scrubbed (which can sometimes be a bit painful). After experiencing this full body cleansing, enjoy a relaxing massage that will make you float out of the steam room, radiating with a divine fragrance. The market stalls in the main souk of the medina offer a range of fresh Moroccan dishes to discover. Do not be put off by street food: it is one of the best that can be found in Marrakesh (and in the world for that matter). 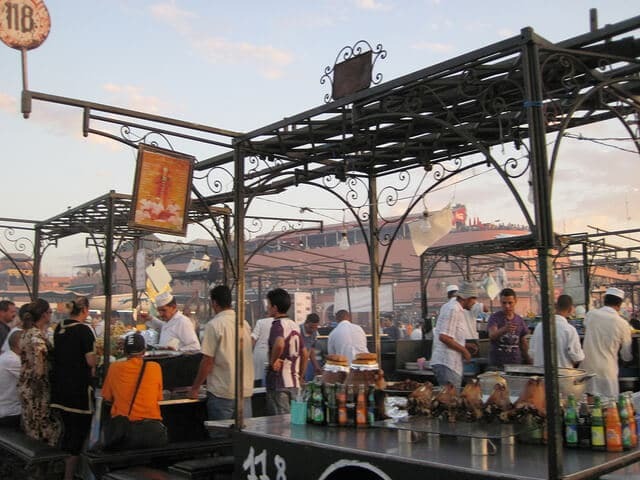 Food stalls are also a lot cheaper than one of the expensive restaurants around the famous plazas, and the food will be cooked right before your eyes while you wait! A few hours drive from Marrakech, the Atlas Mountains is a definite must-see. The temperature may drop, so bring a sweater or a jacket and bring your best hiking shoes. On a rocky path along the mountain, you will cross small bridges over rivers flowing down on the mountain slopes. The view from the mountains is splendid, and is well worth the effort of a day trip. A visit to Marrakesh usually begins during the late afternoon with the exploration of the Place Jemaa-el-Fna, where you will be sure to encounter a few snake charmers. This is the centre of the city, where every evening tourists and locals gather to enjoy the atmosphere. Make sure you see the Koutoubia Mosque, and its impressive minaret overlooking the surroundings. Entrance to the building is for Muslims only. Also, don’t miss the Ben-Youssef Madrasa, a Koranic school with breathtaking architecture. Away from the hustle and bustle of Marrakesh, stroll through the romantic Menara Gardens between ponds and olive groves. 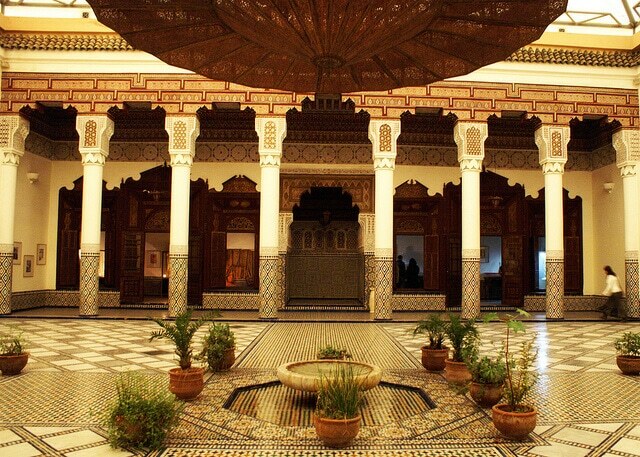 If by now you’re fond of Moroccan style, maybe you’ll end up with a visit to the Bahia Palace. 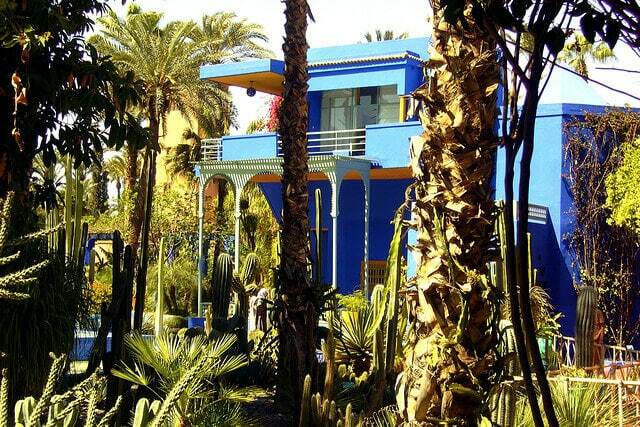 Unmissable in the new city, the Majorelle Garden is a botanical garden with beautiful Art-Deco buildings painted in intense blue. The garden belonged to fashion designer Yves Saint Laurent. When he passed away in 2008, his ashes were scattered in the garden. You will not get tired of it. Morocco being a Muslim country, alcohol is not easy to find, but the tea is delicious. Although some may not find tea to be a great substitute to alcohol, a Moroccan mint tea can be surprisingly refreshing, especially during the hot season. 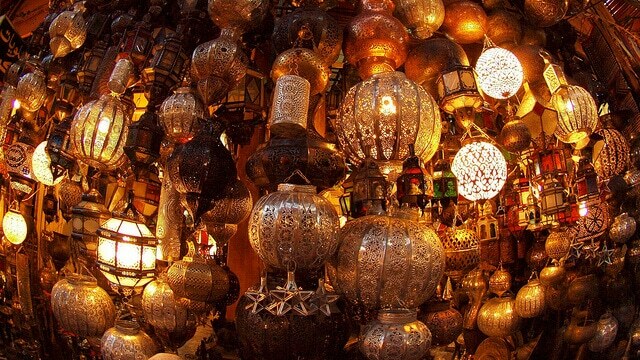 Going to the souks is inevitable if you visit Marrakesh. The souks are the ideal place to make a good deal, but you must be willing to haggle to get a good price. You will actually be expected to do so! How to negotiate? As a general rule, start by halving the quoted price, and negotiate from there. Since you may be a little intimidated at first, do not feel obligated to buy, but do not give up if you are not satisfied with the price. When you visit Marrakesh, you will notice the city is filled with rooftop terraces. If you like to relax and watch people go by, there are quite a few rooftops close to the main square. The perfect place to sit and enjoy a tea or a cocktail, while keeping an eye on the city life happening below. In addition to learning about the history of Marrakesh, a visit to the Marrakesh Museum will give you the opportunity to discover one of the city’s most stunning architectural feat. Located in the centre of Marrakesh, the museum is housed in the Dar Mnebhi Palace, a perfect illustration of classical Andalusian architecture, built at the end of the 19th century. One thing that you will be doing throughout your stay in Marrakesh, and all over Morocco, will be to admire the beautiful mosaics that can be found everywhere. Many museums and hotels have stunning mosaic ponds in the center of their inner courtyard, while floors and walls are usually decorated with superb mosaic artwork. One of the best things to do in Marrakesh: visit the Palmeraie (palm grove), home to more than 100,000 trees – mainly palm trees – on area of about 15,000 hectares. Dates are produced on the palm grove, which also houses a vegetable garden. 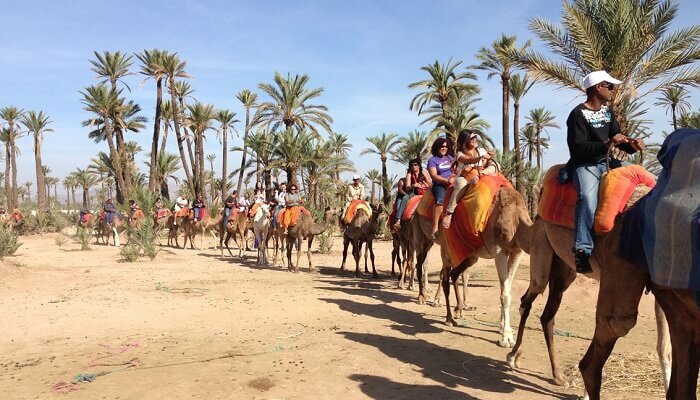 Explore this well known natural and touristic landmark in Morocco, either by camel riding or by quad biking. How to get to Marrakesh? Many airports from Europe offer low-cost direct flights to Marrakesh. To visit Marrakesh, you can search on our partner’s website Skyscanner. Without a doubt, the best way to stay in Marrakesh is to book your stay in a riad located in the medina. To find an inexpensive riad/hotel in Marrakesh, feel free to search this hotel aggregator.